Just yesterday I clicked on two random Twitter links and both took me to articles about blogging. As I was thinking about what to write about today in my blog, I thought maybe I could make a small compilation of the information about blogging which I have been reading, as well as some other sources to help the beginning blogger. So, today’s blog is a blog about blogging! The first article I read yesterday was posted in the Handmade News. The article is “A Beginner’s Guide to Blogging” and includes quick tips like posting regularly, having links to your Etsy, and being patient while waiting for views and comments (I need to work on being more patient myself!). It’s a great place to start if you don’t even know what a blog is-though I guess you must have some clue if you are here reading mine, or if you were there reading theirs. Oh yes, and be concise- that was another tip. I’m working on that, too! The second link I clicked took me to a site called Top Ten Blog Tips. While this site has tons of “top ten” tips, the one I read today was Top Ten Reasons Why Blogging Is Great. What I liked best on this top ten list were numbers 5, you get feedback on your ideas, and number 6, you can teach others. I really do want to get feedback on my ideas, so while I have had miscellaneous comments, I’m hoping to improve the amount of feedback I am getting by asking more questions at the end of my blog (and maybe pleading with my readers to let me know what they like and don’t like!). As for number 6, I am trying to use my blog to post regular tutorials with lots of photos to help people make crafts that I also enjoy making! Another source that is pretty general, but very popular (the first link that comes up when you search”better blogging on Google) Problogger and it’s 31 Days to a better blog challenge. Already I feel like I know a bit more about better blogging from this page. There is a lot of information to absorb here, but worth it for a person like me who want to have a better blog. Another quick, but very informative read is Jennifer Perkins and her Naughty Secretary Club blog on the Business of Creative Blogging. I know I reference Jennifer an awful lot, but she really is a fantastic blog writer, crafter, and business woman. Jennifer’s blog is my go to when ever I am in need of craft business info, and sure enough, she has a great blog about blogging, too! The next source, Whip It, I learned about from Jennifer’s blog. I also just re-read that post of her’s and realized she said she’s in the book I reference below! 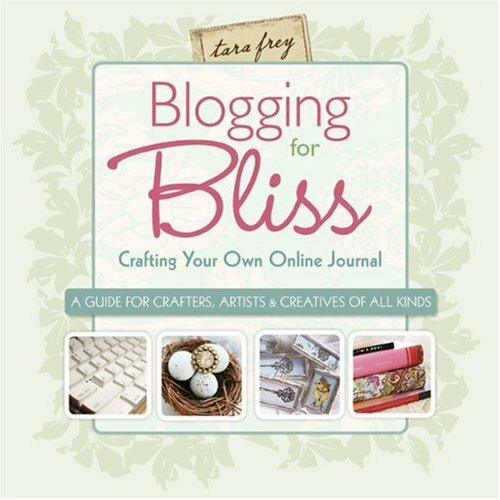 So, even more incentive to get the Blogging for Bliss book (see more below). In addition to these smaller articles about blogging, there are a lot of other sources with great information about blogging. 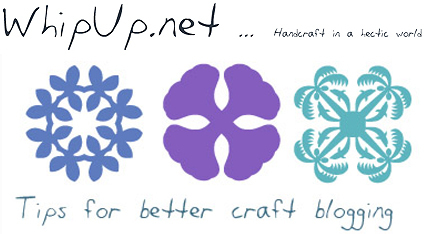 If you are a craft blogger like myself, then the blogging tips at WhipUp.net are quite priceless. The information on this page is so good. I want to do all of these things at once, but I am working on doing all of them as best I can. One set of tips that really have helped me so far are the tips on writing better tutorials (well, I feel like I am writing them well. I hope you like them! Again with the feedback!) . Just a couple of more books to add to my increasingly long list! Well, I really hope this small round up of blogging information is helpful to you. I have found that the more blogs I read, the more ideas I have to write about, so one tip that I didn’t come across is to pay attention to what others are blogging about! It might give you ideas, too. I have found that I like to use my blog regularly to compile information on one topic like I did today. I want you to read and enjoy it, but I also like having a quick place to go back and reference when I need some advice. I wouldn’t post it if I didn’t think it would benefit me as well as my readers! I really hope this information is helpful to you if you are starting a blog or maybe this info will help motivate you to start one. Do you think you will use some of these tips and tricks? What are some websites you refer to when you have questions about blogging? If you have had a blog for a long time now, what are some tips you think would be beneficial to a beginning blogger? Remember, one tip we learned today is that leaving feedback or comments is a great way to get your blog noticed!